It was GREAT.....but now I sort of feel like Linus in The Great Pumpkin.....when he woke up and discovered he had missed "The Great Pumpkin" and realized he had to wait a WHOLE year!!!! Oh, I don't think I missed too much....but it was so much anticipation, so much preparation, and then it all went by in a warp speed blur and ....well..... sniff, sniff......I want to go back!!! I don't want to wait a whole YEAR!!!! LOL!! 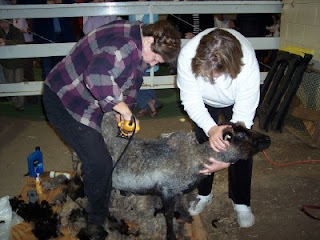 THERE WAS SOME HANDS ON SHEEP SHEARING ASSISTANCE BY CINDY. AND FINE DINING FOR THE ANIMALS TOO!! 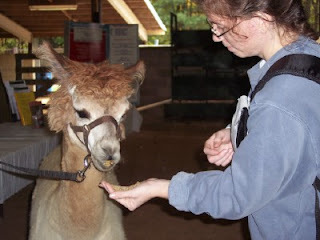 AND OF COURSE THE ANIMALS!!! I'll post more later....when the swelling goes down in my brain from so much stimuli!!!!!!! I'm Just A Knitwit headed to SAFF!!! Yes Ma'am, I am just a big Knit Wit and I am not ashamed to admit it!!! Down right PROUD in fact!!! I am headed to SAFF on Thursday!!! I can't wait to see all the different animals, the process of sheering the sheep to creating yarn.....from Sheep To Shawl I believe is what they call it!! LOL!!! Oh yeah....and the YARN and the ROVING and UNTOLD TREASURES!!!!! I am so looking forward to meeting up with some of you wonderful women I have met through your blogs!!! Depending on how warm/cool it is, our group will be walking around with "Bama Knitter" shirts and/or tote bags....so if you see one of us stop and introduce yourself!!! Lot's of knitting....no telling WHERE our knitting may take place....we have several "after hours" visits to make as well......one involving the Chocolate Fetish in Ashville!! Hmmm.....if knitting were chocolate I wonder what flavor it would be???????? Yep.....it is going to be 4 fun filled days.....I may not sleep a WINK!!!!!!! P.S. 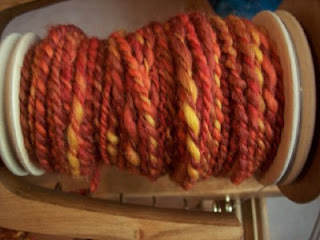 Check out Bibby's yarn...this is her first yarn to spin and it looks AWESOME!!!!!!! Sunday Morning Breakfast and a Surprise Find!! 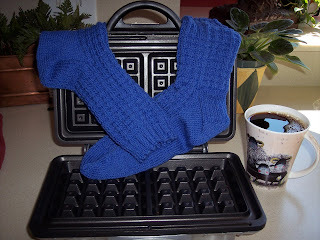 Ahhhh.....what could be better than some hot Blueberry Waffle Socks and a Cup of Java for a Sunday Morning Breakfast!!! I think this pattern has been around for a long time......this is my first pair and definitely won't be my last pair!! Knit with Fortissimo yarn, size one needle, Magic Loop method. Don't you just love it when you run across a site that sells something you like and it turns out to be one of those AWESOME places to shop so much so that you just HAVE to tell everyone about it???? Well here it is..... Wooly Treasures, a shop I found on Etsy quite by accident. 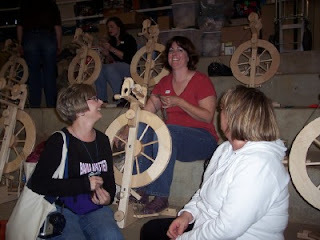 This is a fellow Alabamian who dyes, spins, knits, crafts......you name it. By and large I think most fellow knitter/spinners will always be kind enough to share a word or two with you about their craft but Janey has gone out of her way to answer so many questions, offer suggestions and advice to this new spinner!! I have ordered several bags of her roving and I can tell you that the pictures on her site do NOT do justice to the beautiful colors she dyes!!!! I love the fact that she packs her roving in clear cellophane bags tied with ribbon, like a present for you or wrapped and ready to go as a gift!!!! If you have a color combination in mind Janey will correspond with you to get down pat just the colorway you are looking for prior to dying!!! Just an awesome lady to chat with!!! Take a minute to bookmark Wooly Treasures and check in regularly!!! 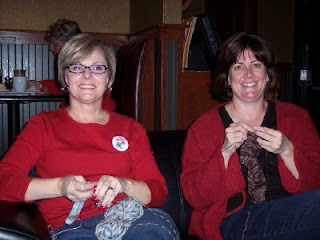 Email Received Today From Cindy: Don't you hope they have yarn in Heaven? My Reply: Well….If they DON’T then I guess that means we didn’t make it to heaven!!! I hope my Heaven is ONE BIG YARN store and I have unlimited credit!!!!!!!!!!! 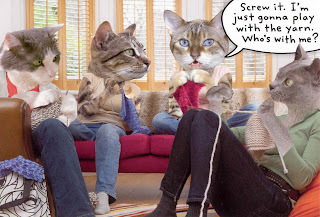 It's Thursday......That Means KNIT NIGHT!!! 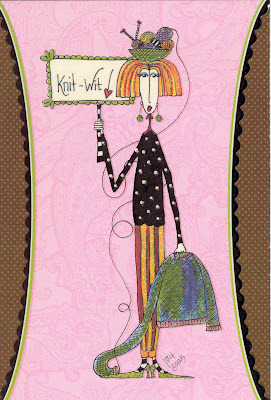 Tonnie sent me this card and it just SOOOO reflects our Chicks With Sticks group!!! Invariably someone is frogging or tinking because we can't seem to keep on track with our pattern knitting due to all the "distractive" conversations!!! 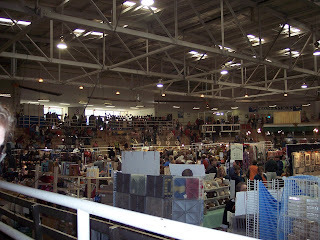 Some knitting related and oh so many NOT knitting related!!! LOL!!! (Oh my can we get off the beaten path)!! LOL!!! Someone always makes the comment that next week they are going to bring something that doesn't require a pattern so they can knit without messing up!!! LOL!! After an exhaustive input of Data into our system, including logarithms, the binary system and maybe even a bit of quantum physics we have CONTEST WINNERS!!!!! The 50th person to comment was Renee!!! NICOLE!!!!! Congratulations Nicole!!! I haven't had time to go all the way through Nicole's blog but considering she is not only a knitter but a fellow dog lover I'm thinking we have quite a bit in common!!!!! LOVE her creative way of using her dogs to display her knitting.....how DO you get them to behave so well??? I'll be in touch with Nicole and let her choose what color STR from my stash she would like. Thanks again Nicole for entering!!! AMY......who states she hasn't knit very many socks....so she is in for a real treat with the Sophie's Toes yarn!!! 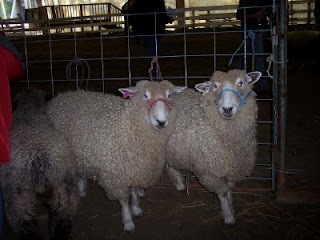 SheepsPyjamas....Don't you just love that name? A skein of sock yarn will be on it's way to you!!!!! Many, many thanks for all the folks that commented....in the next week or so I'll be going through all the blogs...I am SO looking forward to finding out what patterns everyone enjoys and adding some new one's to my pattern collection!!!! CONTEST UPDATE AND ADDITIONAL YARN GIVE AWAY!!! I thought it would take me a month to H.O.P.E.F.U.L.L.Y get 50 comments but looks like I am going to have my 50th comment by lunch time today!!! In order to give folks more time to participate here is what I am going to do. First 50 folks go into the drawing for the STR yarn as well as for the drawing for my second favorite sock yarn as stated in the post below. When I get to the 100th comment I will close the contest and enter the last 50 into the drawing for another skein of yarn!! Please be sure and leave your comment in yesterday's post. THANK YOU SO MUCH!!!! 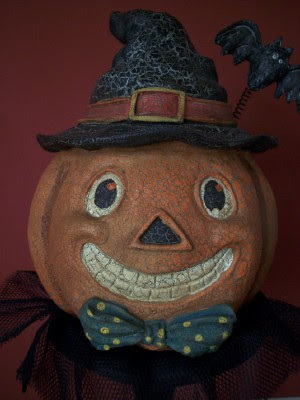 I am so tickled to find so many new bloggers and will be checking out your blogs!!! I have already seen so many patterns I haven't heard of not to mention so many of you love some of the socks that I felt I was missing out on!!! Been feeling guilty for awhile by just sticking to my tried and true "vanilla"sock...but looks like a lot of you enjoy it too!!!!! What's in YOUR Salad Spinner, The Grinch Came Early This Year AND A CONTEST!!!! Do NOT adjust your monitors....you are NOT crazy....That IS Yarn in the Salad Spinner!!! Bibby ran by yesterday morning and brought me this!!! What a GREATidea!! 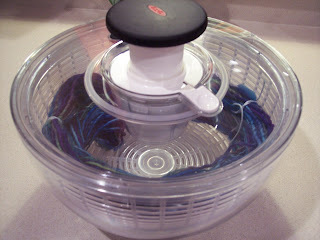 After soaking my single ply yarn the entire hank was bone dry the next morning.....despite rolling my 2 ply yarn in a towel it took 3 days for it to get completely dry...I could NOT get all the water out.......enter Bibby's fabulous Salad....I mean Yarn spinner!!!!!!!!! (and this is a Wayyyyy nicer spinner than the one I use for FOOD)!! LOL!!! Got to have your priorities straight......right????????????? LOL!!!!! 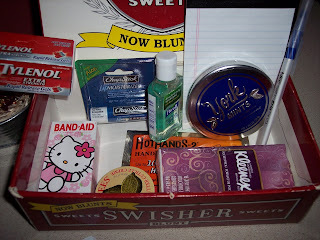 Also included....SAFF Survival Kit!!! All those little essentials that you wouldn't think about until you need them!!! Smart gal that she is even included chocolate....yep....I can survive anything SAFF has to offer!!! LOL!!!!!!!!!! My Sweetie.....they sure can fool you sometimes can't they??? 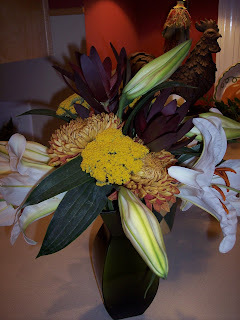 You never know what they are "listening" to when you are talking......but apparently he was listening several months ago because he remembered I love lillys and Fall flowers!!! He got these for me, eagerly telling me how he hand picked the flowers for the girl to arrange!! I'm not sure what the burgandy flower is...sort of looks like a variation of a magnolia bloom....but the lillys smell stinky/good....I love them!!!!!! The picture doesn't do them justice at all!!! Didn't he do good......and to top it off he is color blind!! Sunday with my family, wonderful food homecooked by Mom, (always a treat to sit down to someone else's home cooked food), evening out with my friends....just so very blessed to have great family and friends!!! More than this girl deserves I can tell ya!!!!!!!!!!! Whodathunk that the Grinch coming would be a GOOD thing??!! LOL!!! NO heart full of unwashed socks with THIS Grinch (see lyrics). This pic does NOT do this yarn justice at ALL!! 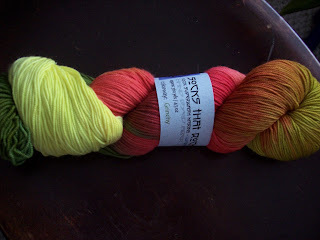 I LOVE these colors and can't wait to get it wound into a yarn cake!!! Cindy, of the aptly named Yarn Nut Blog and one of my many "enabler" friends gave me this yarn nestled amongst a pumpkin patch of gourdylicious gifts.....(if gourdylicious isn't a word is should be)!! After a wonderful evening out with friends.....phone calls and more than a girl deserves (which I won't post but thank you each and every one) I feel the need to pay some goodness forward a bit. SOOOOOOOOOO.....I am having a CONTEST!!!!!!!!!!!!! I feel the need to share the love!!!!!!!! (All while humming the Grinch song to myself)!! And this contest is no three decker saurkraut and toadstool sandwich With arsenic sauce let me tell you!!!!!!!!!! LOL!!! Leave a reply on this email letting me know your favorite sock yarn and favorite sock pattern. (Because I LUV to knit socks...and because it is my contest I get to choose)!! LOL!!! 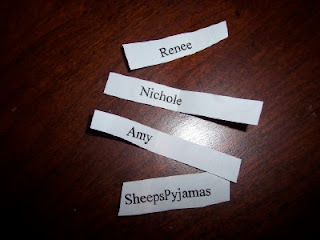 Winner will be drawn by random and receive one skein of STR yarn (my favorite sock yarn). In the event that I can get 50 comments on my blog I'll draw a second place winner to receive a skein of my second favorite sock yarn....which I will leave as a surprise until the winner is drawn. If you can provide a link to the sock pattern you use that would be GREAT!! Spread the word....spread the love!!! I will leave the contest open until November 9th or till I receive 50 comments, whichever comes first ....that should give everyone time don't you think????? Hmmm maybe the 50th commentor deserves something too!!!!!!!!!! Oh MY....WOW!! !I thought it would take me a month to H.O.P.E.F.U.L.L.Y get 50 comments but looks like I am going to have my 50th comment by lunch time today!! !In order to give folks more time to participate here is what I am going to do.First 50 folks go into the drawing for the STR yarn as well as for the drawing for my second favorite sock yarn as stated above. When I get to the 100th comment I will close the contest and enter the last 50 into the drawing for another skein of yarn!! October 15, 100 comments!!! Contest Winners To Be Announced!! Thank you Very Much for your comments!!! So Much ANGST Over A Ball Of Yarn!! Why do you taunt me???? I have envisioned many different beautiful, lush scarves....but NOOOO.....you let me work your lush fibers into my dream scarf then reject my hard work as not worthy of your fibery goodness!!! Could this just be a game to keep me knitting you forever?????? This is the ball-O-yarn I spun from the roving that I bought from Elizabeth . 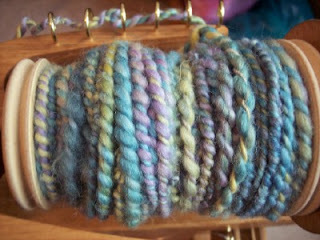 I am SO tickled how the yarn turned out after plying!! I absolutely love the "rustic" looking, thick and thin yarn and have wanted to knit a scarf but seems like whatever I knit just looks like a wad of chunkiness!! I tried a K2,P2 but unless some serious blocking will cause it to keep it's shape it just wound up on itself......tried a straight knit scarf and it just looked like a bunch of nubby yarn I threw around my neck. How does one knit a scarf using thick/thin yarn and make it look like a scarf? These are size 15 needles....I have also tried 11 adn 13. 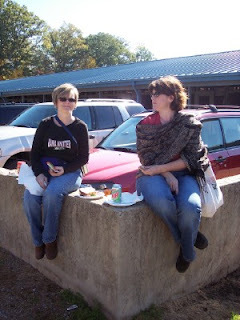 AND.....Tonni created some GREAT items for all the Alabama Knitters to purchase from Cafepres.com!! Check it out!!! http://www.cafepress.com/knitlog/0 The tote bag is large enough to double as a shopping bag!! There is WAYYY too much stuff going on this month and it has barely started!! I have the Sockamania sock pattern that arrived yesterday. .....AND.....I have yarn that was bought specifically to make a pair of socks to wear to SAFF....sort of a sock challenge, 3 girls, same yarn....3 different sock patterns. Uhmmmm.....I may not get my socks finished...especially since I haven't even cast them on yet...but will do that tonight! Maybe I can get ONE finished so I won't be too humiliated....I have only had the yarn for about ...well, lets just say ample time to knit a pair of socks! 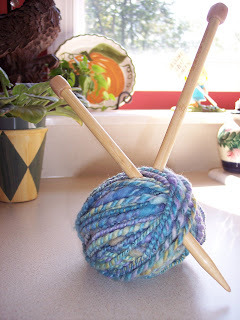 AND...I've been Plying some yarn.....like everything else...this will require practice! LOL!! I won't go into what happens when you ply in the same direction that you spin. 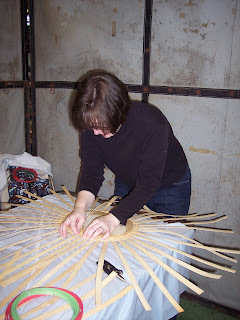 It looked like REALLY LARGE Rami noodles , involves four letter words and we'll just leave it at that!!!! LOL!!! Me Lovelies!!!!!!!! (Shown in crappy lighting)!